South Africa’s Constitution recognises 11 official languages: Sepedi (also known as Sesotho sa Leboa), Sesotho, Setswana, siSwati, Tshivenda, Xitsonga, Afrikaans, English, isiNdebele, isiXhosa and isiZulu. For centuries South Africa’s official languages were European – Dutch, English, Afrikaans. African languages, spoken by at least 80% of the people, were ignored. In 1996 South Africa’s new Constitution gave official protection to all major languages. South Africa has about 34 historically established languages. Thirty are living languages, and four extinct Khoesan languages. 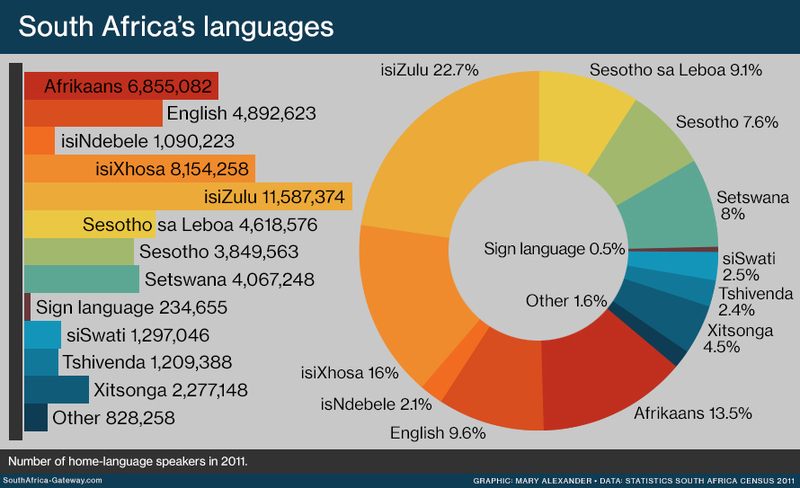 IsiZulu is South Africa’s biggest language, spoken by almost a quarter (23%) of the population. Our other official languages are isiXhosa (spoken by 16%), Afrikaans (13.5%), English (10%), Sesotho sa Leboa (9%), Setswana and Sesotho (both 8%), Xitsonga (4.5%), siSwati and Tshivenda (both 2.5%), and isiNdebele (2%). English is an urban language of public life, widely used in the media, business and government. Out of the 4.9-million South Africans who speak English as a first language, a third (33%) are white, a quarter (24%) are black, 22% are Indian and 19% are coloured South Africans. English is widely used as a second language and common language of communication, mainly in the cities. Afrikaans is a version of Dutch that evolved out of a South Holland dialect brought here in the 1600s. Over the centuries it has picked up many influences from African languages, as well as from European colonial languages such as English, French and German. More than half (50.2%) of Afrikaans speakers are coloured, 40% are white, 9% black and just 1% Indian. 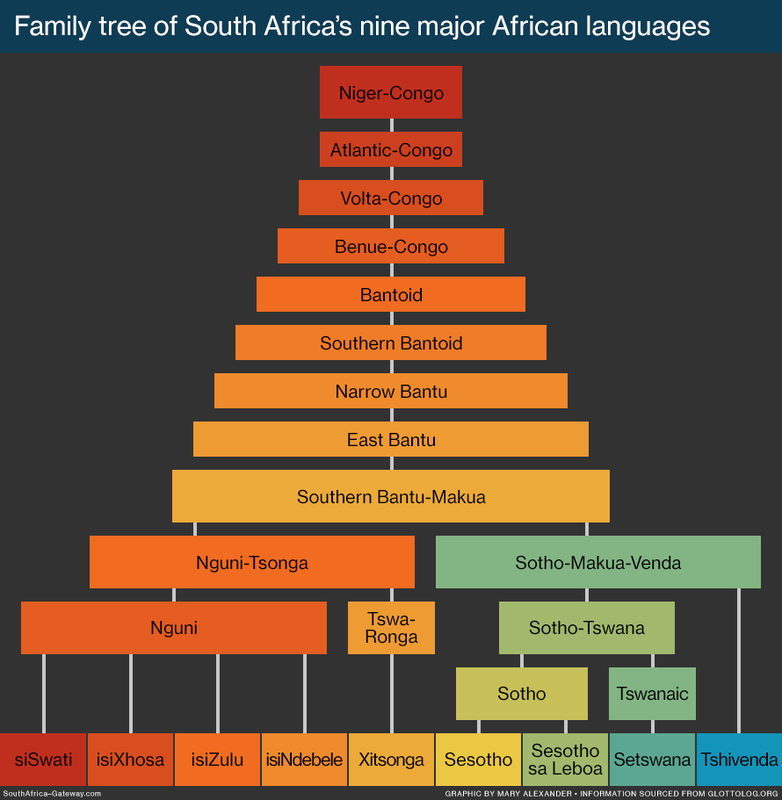 South Africa’s nine African official languages all fall into the Southern Bantu-Makua subfamily, part of the broad and branching Niger-Congo family of languages. The languages arrived here during the great expansion of Bantu-speaking people from West Africa eastwards and southwards into the rest of the continent. The expansion began in around 3000 BCE and was largely complete by 1000 CE. Like all languages in the Niger-Congo family they are tonal languages, in which either a high or low tone gives a word a different meaning. Within the first group Xitsonga alone falls into the Tswa-Ronga subfamily, while isiZulu, isiXhosa, isNdebele and siSwati are Nguni languages. Similarly, Sesotho, Sesotho sa Leboa and Setswana are closely related Sotho languages, and Tshivenda something of a standalone in the Sotho-Makua-Venda subfamily. South Africans are more than bilingual. 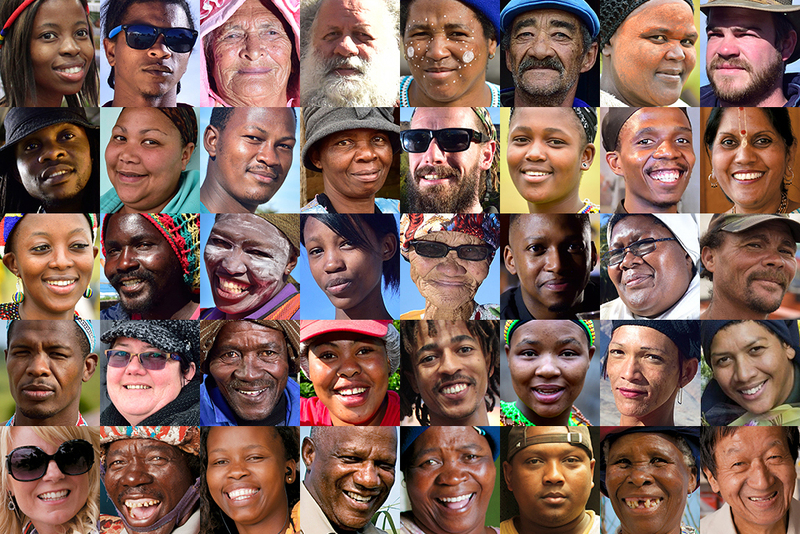 A rough estimate based on Census 2001 first-language data and a 2002 study of second-languages speakers is that the average South African – man, woman and child – uses 2.84 languages. Obviously, many people are limited to one, and many others able to speak three, four or more languages. English- and Afrikaans-speaking people (mostly coloured, Indian and white South Africans) tend not to have much ability in African languages, but are fairly fluent in each other’s language. Multilingualism is common among black South Africans. Which two languages does (member of household) speak most often in this household? Thirteen options were given: South Africa’s 11 official languages, plus Sign Language, and “Other”. If a person did not speak a second language, that too was recorded. The contrast between first language and second language is shown in the maps at right. While the geographical pattern of dominant first languages neatly conforms to the facts of history and urbanisation, the picture of second languages is more complicated, more of a mess. The second map reveals a couple of things. The first is how few South Africans speak just one language. The second is that while English is the dominant first language only in the cities – Johannesburg, Cape Town, Durban – it is widely used as a second language across the country. English is spread by the media and used as a common language of communication. But many South Africans are compelled to learn English, and often Afrikaans as well, simply to get a job and to work. These are often poorer people denied an adequate education. Elsewhere in the world the ability to speak many languages is a sign of sophistication. In South Africa, multilingualism – a complex undertaking, especially in languages from very different families – is a common achievement of the poor. Language is fluid, especially in South Africa. Our languages are and have been for centuries in a constant swirl, mixed by work, migration, education, urbanisation, the places we live, friendship and marriage. Because of this, South Africans are a code-switching people. “Code switching” simply means using more than one language in a single conversation. Every adult South African does this at some time, even if they aren’t aware of it. “I-Chiefs isidle nge-referee’s ngabe ihambe sleg. “Chiefs [the football club] have won because the referee favoured them. Otherwise, they would have lost. Influenced by the other languages spoken around them, all of South Africa’s languages change and grow all the time. South Africa’s most recent census was in 2011. The following table gives a breakdown of first-language speakers, as recorded by the census. The languages you hear in South Africa depend on where you are in the country. Unless otherwise indicated, all figures used below are from Census 2011 and refer to first language (language spoken at home) only. Afrikaans evolved out of a 17th-century Dutch dialect introduced to South Africa in 1652 when the Dutch first colonised the Cape of Good Hope. Today it is the majority language of the Northern Cape. Afrikaans became an official language in South Africa with the Official Languages of the Union Act of 1925, which retroactively dated the language’s official status to 1910. The 6,855,082 South Africans who speak Afrikaans as a first language make up 13.5% of the country’s total population. 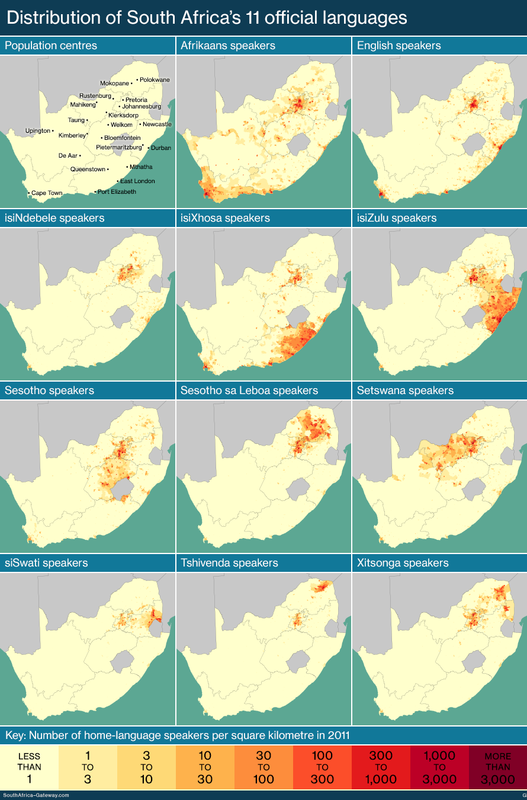 More than half (50.2%) of these Afrikaans speakers are coloured, 39.5% white, 8.8% black, 0.9% Indian or Asian, and 0.6% other. More than three-quarters (75.8%) of coloured South Africans speak Afrikaans, as do almost two-thirds (60.8%) of whites. It is the home language of 4.6% of Indian or Asian people, and of 1.5% of black South Africans. Most Afrikaans speakers (41%) live in the Western Cape, and 21% in Gauteng. Ten percent of all Afrikaans speakers live in the Eastern Cape, 8.8% in the Northern Cape, and 5% in the Free State. Within the provinces, Afrikaans is the majority language in the Northern Cape (53.8%) and the Western Cape (49.7%). It makes up 12.7% of languages spoken in the Free State, 12.4% of Gauteng’s languages, 10.6% of languages in the Eastern Cape, 9% in North West, 7.2% in Mpumalanga, 2.6% in Limpopo and 1.6% in KwaZulu-Natal. English is a prominent language in South African public life, widely used in government, business and the media. As a first language it is mainly confined to the cities. In 1910 English and Dutch were declared the official languages of the new Union of South Africa. English has retained this official status ever since. The 4,892,623 South Africans who speak English as a first language make up 9.6% of the country’s total population. Among first-language English speakers, 32.8% are white, 23.9% black, 22.4% Indian and 19.3% coloured. The majority (86.1%) of Indian South Africans speak English as their home language, as do over a third (35.9%) of whites. It is the first language of 20.8% of coloured people, and of 2.9% of black South Africans. The largest number of English speakers are in Gauteng – 1.6-million people, or a third (32.8%) of all English-speaking South Africans. Over a quarter (27.3%) live in KwaZulu-Natal, 23.5% in the Western Cape, and 7.4% in the Eastern Cape. English is a minority language within all nine provinces. It is the second-largest language in both the Western Cape (after Afrikaans) and Gauteng (after isiZulu). In the Western Cape it is spoken by 20.2% of the population, and in Gauteng by 13.3%. English is minimally spoken in the other provinces. IsiNdebele is the least spoken of South Africa’s 11 official languages, and confined mainly to Mpumalanga and Gauteng. It is an Nguni language, like isiZulu, isiXhosa and siSwati. Also called Southern Ndebele, it is not to be confused with Northern Ndebele, more commonly known as Matabele, which is closer to isiZulu and an official language of Zimbabwe. The 1,090,223 South Africans who speak isiNdebele as a first language make up just 2.1% of the country’s total population. Among first-language isiNdebele speakers, 97% are black, 0.9% Indian or Asian, 0.8% coloured, 0.8% white and 0.5% other. IsiNdebele is spoken by 2.6% of black South Africans – fewer than the 2.9% who speak English at home. It is barely spoken by other population groups, being the home language of 0.2% of both the coloured and white population, and 0.8% of Indian or Asian people. It is also spoken by 2.1% of people who describe themselves as “other”. Most isiNdebele speakers (37%) live in Mpumalanga, followed by Gauteng (34.9%), KwaZulu-Natal (10.2%), Limpopo (9.6%) and North West (4%). IsiNdebele is a minority language in all the provinces. It is spoken by 10.1% of the population of Mpumalanga and 3.2% of Gautengers. The dominant language of the Eastern Cape, isiXhosa is also the second-largest language in South Africa after isiZulu. It is an Nguni language, like isiNdebele, isiZulu and siSwati, but also shows some influence from the Khoekhoe languages. The 8,154,258 South Africans who speak isiXhosa as a first language make up 16% of the country’s total population. Among first-language isiXhosa speakers, 99.4% are black, 0.3% coloured, 0.2% white and 0.1% Indian or Asian. Among the population groups, isiXhosa is spoken by 20.1% of black South Africans, the second-largest share after isiZulu. It is the home language of 0.6% of coloured people, 0.4% of Indians, 0.3% of whites and 1.9% of people who describe themselves as “other”. Close to two-thirds (62.4%) of first-language isiXhosa speakers live in the Eastern Cape, and 17.2% in the Western Cape. About a tenth (9.8%) of all isiXhosa speakers live in Gauteng. Within the provinces, isiXhosa is the majority language in the Eastern Cape, where its 5,092,152 first-language users make up 78.8% of the population. In the Western Cape a quarter (24.7%) of the population speaks isiXhosa. IsiXhosa is spoken by 7.5% of people in the Free State, 6.6% in Gauteng, 5.5% in North West, and 5.3% in the Northern Cape. IsiZulu is the most widely spoken language in South Africa, the first language of close to a quarter of the population. It is the dominant language of KwaZulu-Natal. Like isiNdebele, isiXhosa and siSwati, isiZulu is an Nguni language. The 11,587,374 South Africans who speak isiZulu as their home language make up 22.7% of the country’s total population. A full 99.4% of first-language isiZulu speakers are black, 0.2% coloured, 0.1% white and 0.1% Indian or Asian. IsiZulu is spoken by 28.5% of black South Africans, more than any other language. It is the home language of 1.3% of Indian or Asian people, 0.5% of coloureds, 0.4% of whites and 4.1% of people who describe themselves as “other”. Over two-thirds (68.2%) of isiZulu-speaking South Africans live in KwaZulu-Natal, and more than a fifth (20.6% in Gauteng). Some 8.3% of all isiZulu speakers live in Mpumalanga, which borders KwaZulu-Natal to the northwest. The rest are thinly spread across the other provinces. Within the provinces, isiZulu is spoken by over three-quarters (77.8%) of the population of KwaZulu-Natal, and nearly a quarter (24.1%) of the people of Mpumalanga. Almost a fifth (19.8%) of Gautengers speak isiZulu. It is a small minority language in the rest of the provinces. Sesotho is the language of the Free State, and the first language of 3,798,915 South Africans, or 7.6% of the total population. It is one of the three Sotho languages, with Sesotho sa Leboa and Setswana. A full 98.7% of first-language Sesotho speakers are black, 0.6% coloured, 0.5% white and 0.1% Indian or Asian. Sesotho is spoken by just under a tenth (9.4%) of black South Africans. It is the home language of 0.5% of coloured people, of 0.4% of both white and Indian/Asian people, and of 1.7% of the people who describe themselves as “other”. Most (44.6%) Sesotho speakers live in the Free State. The inner curve of this bean-shaped province fits around the northwest border of Lesotho, a country where Sesotho and English are the official languages. 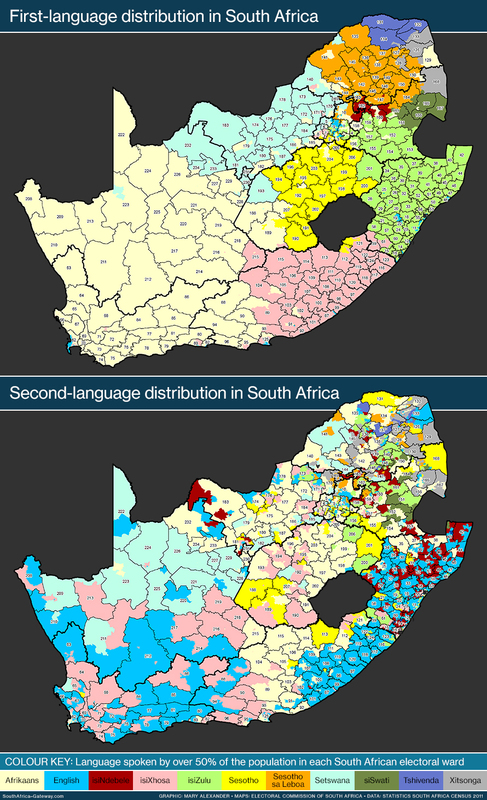 Over a third (36.2%) of all Sesotho-speaking South Africans live in Gauteng. Some 5.2% live in North West. Within the provinces, Sesotho is spoken by close to two-thirds (64.2%) of the population of the Free State, over a tenth (11.6%) of Gauteng, and by 5.8% of people living in North West. Sesotho sa Leboa or Sepedi? The 1993 interim Constitution named the language Sesotho sa Leboa. It was then changed to Sepedi in the final Constitution of 1996. Debate on the right name continues. Most language experts, as well as speakers of the language, consider Sesotho sa Leboa to be the correct name, and Sepedi to be a dialect. In a study of the language policy of six South African universities, five used Sesotho sa Leboa and one Sepedi. However, both the Department of Basic Education and Statistics South Africa use Sepedi as the language’s name. Do you speak the language? Do you call it Sepedi, or Sesotho sa Leboa? Let us know in our Facebook poll. Sesotho sa Leboa is South Africa’s third-largest African language (after isiZulu and isiXhosa), and mainly spoken in Limpopo. Like Sesotho and Setswana, it is a Sotho language. Sesotho sa Leboa is the first language of 4,618,576 people, or 9.1% of the total population. A full 99.7% of first-language Sesotho sa Leboa speakers are black, 0.1% coloured, 0.1% white and 0.1% Indian or Asian. Sesotho sa Leboa is spoken by 11.4% of black South Africans. It is the home language of just 0.2% of Indians, 0.1% of coloureds, 0.1% of whites and 0.6% of people who describe themselves as “other”. Nearly two-thirds of (61.2%) of all Sesotho sa Leboa speakers live in Limpopo, over a quarter (27.8%) in Gauteng and 8.1% in Mpumalanga. The rest of the language’s speakers are scattered around the country. Within the provinces, Sesotho sa Leboa is spoken by more than half (52.9%) the people of Limpopo, 10.6% of those in Gauteng, and 9.3% of Mpumalanga’s population. The language of North West and its neighbouring country of Botswana, Setswana is the Tswanaic language in the Sotho-Tswana subfamily, which it shares with Sesotho and Sesotho sa Leboa. Its 3,996,951 speakers make up 8% of South Africa’s population. Some 98.3% of Setswana speakers are black, 1% coloured, 0.1% Indian or Asian and 0.1% white. Setswana is spoken by 9.9% of black South Africans, making it the third-largest language in the population group. It is the first language of 0.9% of coloured people, 0.4% of both Indians and whites, and 2.4% of people who describe themselves as “other”. Over a half (52.9%) of Setswana speakers live in North West, a quarter (26.9%) in Gauteng, and close on a tenth (9.2%) in the Northern Cape. Both North West and the Northern Cape lie on the border of Botswana, where 79% of the population speak Setswana. Within the provinces, Setswana is spoken by nearly two-thirds (63.4%) of the population of North West, a third (33.1%) of the Northern Cape’s people, by 9.1% of Gauteng’s population and 5.2% of the Free State’s. SiSwati is mostly spoken in Mpumalanga, which along its curved eastern border almost encircles the country of Swaziland. SiSwati is an Nguni language, like isiNdebele, isiXhosa and isiZulu. The 1,297,046 people who speak siSwati are just 2.5% of South Africa’s population, making it the country’s third-smallest language. Among first-language siSwati speakers, 99.3% are black, 0.3% coloured, 0.2% white and 0.1% Indian or Asian. In the population as a whole, siSwati is spoken by 3.2% of black South Africans, by around 0.1% of the other population groups, and by 0.5% of people who describe themselves as “other”. Most siSwati speakers live in Mpumalanga – 85.3% of its total users and the highest provincial concentration of any language. Another tenth (10.5%) live in Gauteng, and the rest are scattered mainly over the northern parts of the country. Within the provinces, sisSwati is spoken by 27.7% of the total population of Mpumalanga, and just 1.1% of Gautengers. Tshivenda is something of a standalone among South Africa’s major African languages, falling into the broader Sotho-Makua-Venda subfamily but not part of the Sotho group. It is mostly spoken in the far northeast of Limpopo. The 1,209,388 South Africans who speak Tshivenda are just 2.4% of the country’s population, making it the second-smallest language after isiNdebele. A full 99.4% of first-language Tshivenda speakers are black, 0.2% coloured, 0.2% white and 0.1% Indian or Asian. 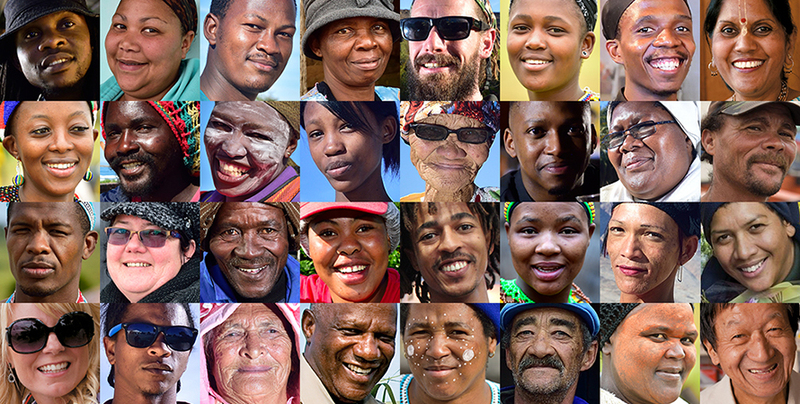 Tshivenda is spoken by 3% of black South Africans, by just 0.1% of the other population groups, and by 0.5% of people who describe themselves as “other”. Three quarters (73.8%) of Tshivenda speakers live in Limpopo, giving the language the second-highest provincial concentration after siSwati. A further 22.5% of Tshivenda speakers live in Gauteng. Within the provinces, Tshivenda is spoken by 16.7% of the population of Limpopo, and 2.3% of the population of Gauteng. Xitsonga is a minority language concentrated along South Africa’s northeast border with the country of Mozambique, where it is also spoken. Within the broader Nguni-Tsonga language subfamily which it shares with isiNdebele, isiXhosa, isiZulu and siSwati, it alone falls into the Tswa-Ronga group, while the other languages are Nguni. The 2,277,148 South Africans who speak Xitsonga as their home language make up 4.5% of the country’s total population. A full 99.1% of first-language Xitsonga speakers are black, 0.2% white, 0.1% coloured and 0.1% Indian or Asian. Xitsonga is spoken by 5.6% of black South Africans, 0.2% of Indians, 0.1% of whites, 0.05% of coloureds and 3.9% of people who describe themselves as “other”. Nearly two-fifths (39.8%) of Xitsonga-speaking South Africans live in Limpopo, over a third (35%) in Gauteng, 18.3% in Mpumalanga and 5.6% in North West. Within the provinces, Xitsonga is spoken by 17% of the population of Limpopo, 10.4% of Mpumalanga and 6.6% of the people in Gauteng. Glottolog – Comprehensive reference information for the world’s languages, especially the lesser known languages. Researched, written and designed by MC Alexander.